When Jennifer Stevens saw a poster in the women’s restroom at the Ohio Air Force base where she works as a federal employee, she was outraged. Stevens, a 10-year veteran of the armed forces and a battalion commander in the Ohio National Guard, told Business Insider that it reflects a key problem of the military’s sexual assault saga — putting responsibility for being sexually assaulted on the victims. With an estimated 26,000 sexual assaults in the military last year and less than 3% of them resulting in punishment for the perpetrators, it’s incredible that those in charge of preventing and responding to sexual assault would think the answer would involve telling prospective victims not to get sexually assaulted. Stevens said it’s one of the biggest problems in the military’s sexual assault prevention and response strategy. So she did something about it. 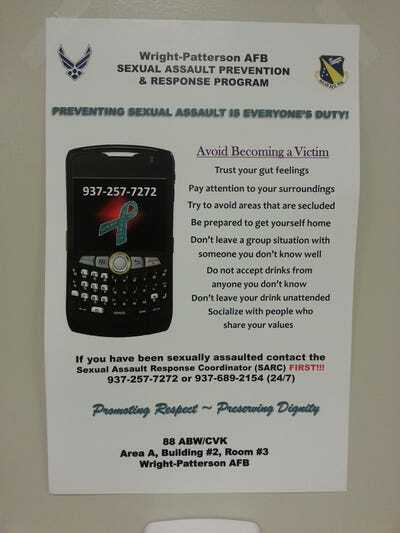 Stevens wrote a letter detailing what information victims of sexual assault should know, and she posted it over the Air Force’s poster. “Please take a moment to think about how you would feel if you had been assaulted and you went to a [Sexual Assault Response Coordinator] or Victims Advocate and one of the first questions they asked you was what you were wearing or if you were alone or if you were drunk,” she wrote. “We have implemented robust training for all Airmen designed to both deter potential offenders as well as give Airmen the awareness and tools they need to step in and stop assaults from taking place,” the statement said. What the statement didn’t specifically say was the hours, methods, or repetition of the base’s training, nor did it mention the content of said training (and certainly “robust” means there’s lots of content to share). Needless to say, the base didn’t offer up so much as a PowerPoint presentation.